Ever since Man has had the materials to record nature, he has done so. To understand the world around us is to understand our place in it. Even now with the development of technology, hand drawn illustrations still have an important role to play in the interpretation of natural history subjects. Nature is observed not through the eye of a lens, but through an artistic as well as a scientific one. 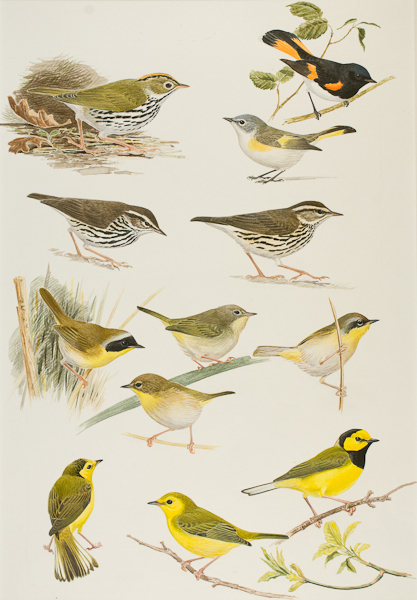 In these wonderful studies of American Wood-warblers by Laurel Tucker this combination is clearly visible. Laurel Tucker was born in Guernsey, attending Ladies College before moving to England in 1970 to complete a Degree Course at the Faculty of Art and Design at Bristol Polytechnic. Her illustrations can be found in many bird books, including The Handbook of Bird Identification for Europe and the Western Palearctic, the RSPB Handbook of British Birds, the MacMillan Guide to Bird Identification and The Big Bird Race by Bill Oddie. Sadly this talented young illustrator's life was cut short when she suffered a cerebral haemorrhage aged just thirty-five.